Last Monday was the worst hurricane or “superstorm” to be seen by the east coast. New Jersey’s shore line devastated. Fires rage in New York City boros and burn homes to the ground. Manhattan darkened. Possessions lost, homes destroyed, and lives changed forever. A recovery and clean up seems eternal. Gas lines may be getting shorter but so are people’s patience. Power has yet to be restored in many locations while families suffering their worst heart break have yet to receive help of any kind. My family has roots in Belmar, NJ. One of the shore towns hit hard by Sandy. 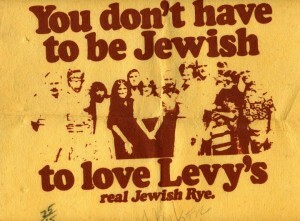 My grandparents ran Levy’s Bakery on F Street for many years. My Aunt Norma and Uncle Herbie lived down there until the mid 90’s. I practically grew up in Belmar. I can remember not just being on the beach and enjoying the ocean, but the holidays with family, spending hours upon hours at Rooftop Golf and Arcade, Zelbe’s, Siderhoff’s hot dogs, Klein’s, Djai’s, Bar A, and so much more of my life happened in Belmar. Sandy removed the entire boardwalk and dropped it off three blocks from the beach. A town devastated along with many communities that seek assistance in rebuilding the Jersey shore. Like many Jersey natives my heart sank lower and lower watching the destruction. Not just here in New Jersey, but Staten Island, Long Island, and every area in new York ravaged by Sandy. I felt the need to do something. I am not sure what exactly, but I wanted to do something for those that had their lives disrupted and still looking for the pieces to get it back together. So many individuals, companies, Government groups, and so many more are doing what they can to raise funds and material items for those displaced by Hurricane Sandy. I did not want to carbon copy anyone and wanted an effort to be fun and unique while supporting a great cause. I thought about the Jets fans I had met while filming my documentary about the Jets and their fans. Here you have thousands upon thousands already in one location and many would be willing to support a great cause. But why just limit it to the Jets? Giants fans are very passionate and dedicated. They bleed red and blue as much as a Jets fan bleeds green. So extending an opportunity to donate to a cause that affected us all seemed only natural. But the catalyst. The concept to bring it all together to make it a worthy event where fans could give their time and donate to Hurricane Sandy relief. Then it hit me. Every Jets and Giants fan likes to party and celebrate before any game. Getting friends and family together to throw back some cold ones, grill up our meaty feast, and yell at those fans who wear the jerseys of the opposing team. Ahh, yes….tailgating! 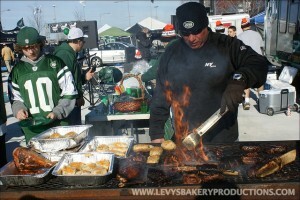 On behalf of Football Reporters Online, I am organizing Tailgate 4 The Tri-State. We are looking for any and all New York Jets and Giants tailgaters to support T4T as all proceeds will go to The Mayor’s Fund for NYC Hurricane Relief and the Hurricane Sandy New Jersey Relief Fund. Myself and others not just lost power, but many lost food, belongings, and homes as well. As New York area fans, we want to provide support for those who need to start over. That is why we are organizing this relief effort to cover both the Jets and Giants tailgating. Giants/Green Bay Packers game & Sunday, December 2nd at the Jets/Arizona Cardinals game. 1-Many tailgating groups charge a fee to be able to partake in their tailgate. We ask if these tailgate groups could donate a portion of those fees towards the Tailgate 4 The Tri-State effort. 2-A group could also make one lump sum donation from everyone in that tailgate as well. 3-The CELEBRITY APPRENTICE donation. This is for very few willing to make the kind of donation that speaks volumes. Many will laugh at Number 3, but you never know how generous someone will be. The Giants & Jets have already given $500,000eacg for Hurricane Sandy relief. We as Jets and Giants fans have a chance to show our support and make our contribution. We have an opportunity to be heard loud and clear. 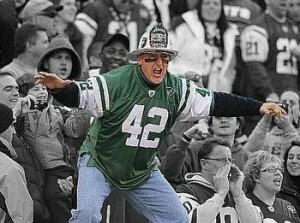 As of now the Jets tailgate on December 2nd will get loud as Fireman Ed Anzalone is on board with T4T. 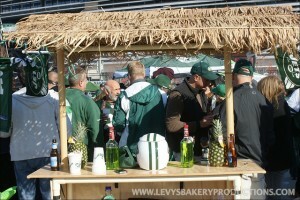 Fireman Ed will be offering his time at where we designate the central tailgate to be. We will designate a flagship tailgating location at both games once we hear back from those wanting to participate. We just started reaching out to fans, other companies, and former players to get involved with T4T, so updates will be coming. They can be found on our Facebook page. I am sure you know time is of the utmost importance on this (organizing this project). I hope the Jets organization would want to support their fans efforts in coordinating a program to raise funds for Sandy relief. Please contact me with any questions or when a decision is reached. Thank you for taking the time to consider this for your next home game. After hearing back from the Jets, they regretfully can not get behind and endorse a cause that is being held on the MetLife Stadium property due to other contractual obligations. They will be announcing their own efforts where fans can help raise funds during the New England Patriots game on Thanksgiving. So for our effort during tailgating, we will not have the Jets support. The Jets can only support fans efforts away from MetLife Stadium. For those Jets or Giants tailgaters looking to have their tailgate participate in Tailgate 4 The Tri-State can e mail us at Tailgate4TriState@gmail.com or visit our Facebook page where there is additional contact information.